It is has been such a long time since I have played in Blogger's Challenge! I am thrilled to be able to share my card today for the theme: "For the Birds." Plus -- I get to do a sneak peek of one of the April 2012 Technique Junkie Newsletter techniques, too! My card uses the gorgeous peacock stamp from I Brake For Stamps. I love this stamp - but it needs to be colored right to do it justice. This method of coloring: Copic Colored Embossing (from the upcoming issue of the TJ Newsletter) seems to fit it perfectly! I was able to get the color intensity appropriate for a peacock with this method. And it is FAST and FORGIVING. Gotta love quick easy color methods! My flowers are a suede variation of Taffeta Flowers from the April 2011 issue of the newsletter. If you are a subscriber, the online version will be available to view on April 1st. The paper version will not be mailed for several days; there was a problem with the first printing and I was unwilling to send you something I was not proud of. This is the first time in nearly 10 years of publishing that the newsletter is going to be late, and I am a bit stressed out about it -- but I would rather have it be right than on-time and wrong. I hope you understand! An email will be sent to all paper subscriber tomorrow with details. In the meantime, go online on April 1st to see the tutorials! Back to the card...When I was a little girl, my parents owned a tiny cottage near the shores of Lake Erie in Canada. In the farms behind our cottage, there was a farm that raised peacocks! One of my favorite things to do as a kid was to scour through our backyard and the woods to look for feathers, because the peacocks frequently escaped. They were prized possessions! I can remember more than one morning when I got up early and saw a peacock in full plume in our back yard. One of my better memories, that's for sure! If you want to play along with today's Blogger's Challenge, go to Lisa's Blog and follow the directions (I have a link below, too). Click on the other links to enjoy all the artwork, too! Have a great weekend. Yesterday I posted a card that was started as something else -- and today I am posting the second card from the not-what-it-started as creativity session. This started as a stencil-based card -- not so much! 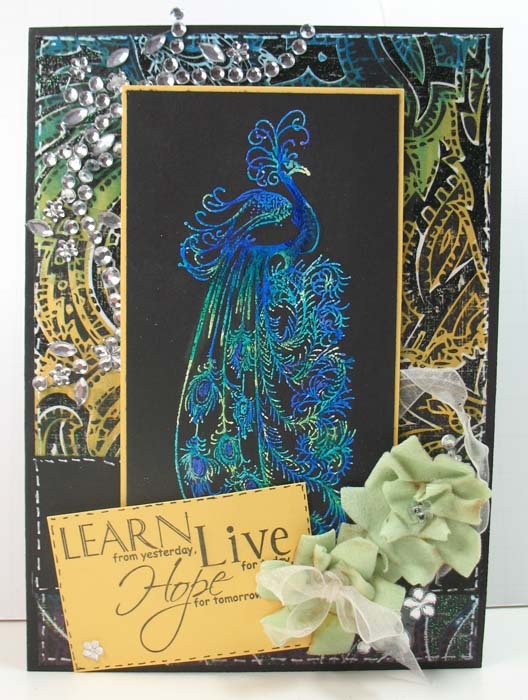 This card uses the Stacked Nesties Technique from the October 2011 issue of the Technique Junkie Newsletter. I love this technique -- it is so elegant! In addition, I used an old stand-by: Cuttlebug Highlights from the Emboss or Die CD. If you click on the picture, you will see where I added greens and oranges to the texture to give it that extra POP of color. The fox was colored with colored pencils. The stamps are from Mark's Finest Papers, A Heinrich Company from the "What a Fox" set. I love that saying! Did you ever start out to create one thing, then end up with something completely different? That's what happened here. 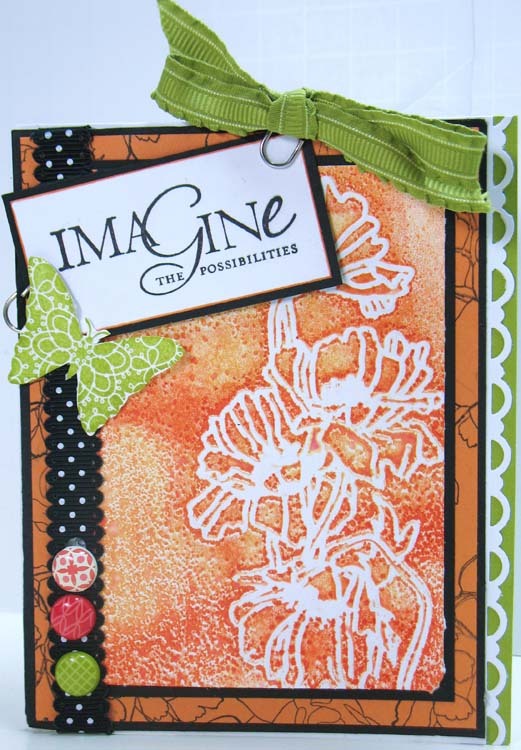 I was going to create a card using the Stencil Stamped Background Technique from the Stampin' Companion CD -- and I ended up with a completely different card! In between, I discovered something new and filmed a tutorial with my discovery. Go figure. Today's card uses two techniques. First, the turtle was colored using the Marker Blending Technique from the Stampin' Companion CD (70 Tutorials exclusively using Stampin' Up! Products - only $17.95!). 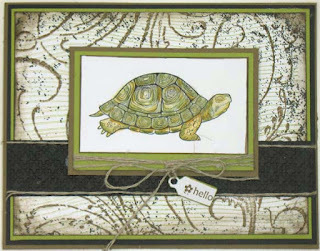 I layered Mr. Tortoise on a background using the Back-to-Back Tutorial from the August 2011 issue of the TJ Newsletter. I'll have to share the other card another time! It has been a LOOONNNGGGG time since I have been creative just for the fun of it. It seems like I am always working on a new issue of the Newsletter or a New CD and I just run out of time to keep up with creating things that just make me happy. Well, I just finished a new CD -- to be announced later this week -- and the newsletter is in great shape, so I allowed myself some unfettered creative time! I decided to play along with the Late Night Stampers weekly challenge #166: Texture. This is how I challenged myself: I opened my Emboss or Die CD and selected a technique randomly, then worked out my card! I wanted to use a color combination that I normally wouldn't, and I really like how this Peach/Tangerine/Limeade combination works. I am so happy to have created this card! I hope you enjoy it. 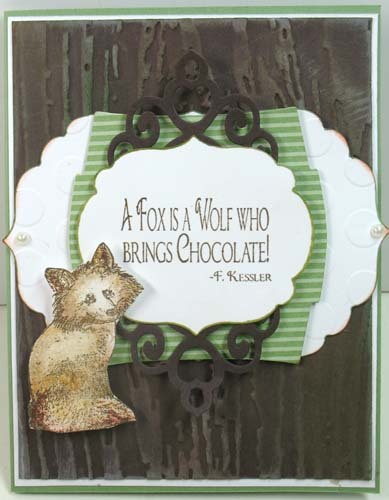 If you would like the directions for the background, it is on the Emboss or Die CD: 79 tutorials using Embossing folders and Die Cuts, for $17.95. I think I will spend part of my week opening CDs and picking tutorials out randomly! 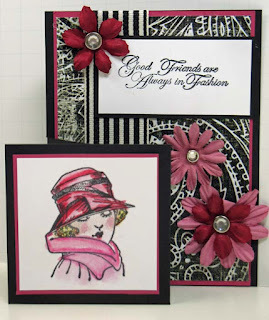 Today we are celebrating the Stampin' Companion CD Tutorials. We wanted to show you that the CD is for everyone -- you will find many inspiring techniques on the CD using ANY stamps and materials! If this is your first stop, take a moment to start at the beginning at the Design Team Blog. Starting there, you will see Judy's gorgeous art, and continue on with Six other people until you are back here. If you arrived from Lisa's blog, you have arrived in the right place! 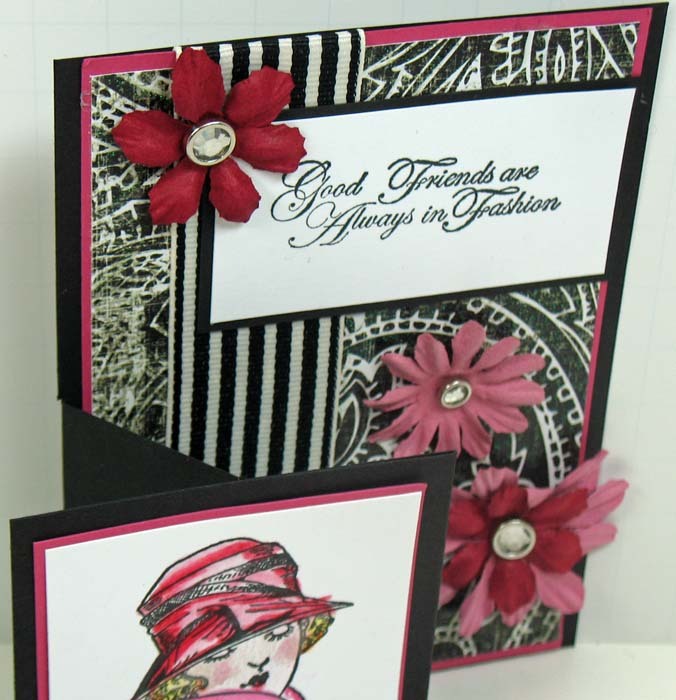 Today I chose to do the Swing Out Card, one of the 70 tutorials on the Stampin' Companion CD. 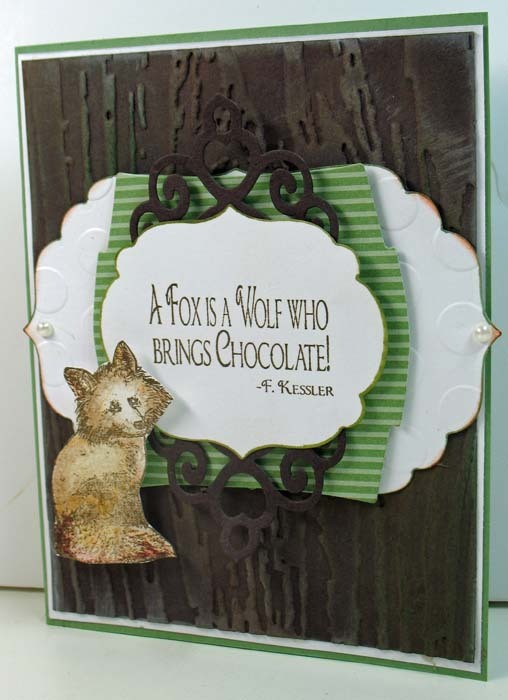 I used stamps from Rogue Redhead Designs -- I think this is a great "girlfriend card"! As you can see from the photo below, the front panel swings out (um, hence the name...). It is a cool 3D effect that allows it to sit on a table for display. This is also my card for Blogger's Challenge this week - Going 3D. Although the Stampin' Companion CD was made with all Stampin' Up! products, I hope our blog has shown that the tutorials are perfectly paired with other companies, too. The CD is $17.95 ($19.95 for overseas) and has 70 pdf, step-by-step tutorials. How can you go wrong with that? Since you spent some time with us today, it's time for the reward! Simply leave comments on the blogs, and here, and on Tuesday morning (March 13) I will pick one lucky winner randomly who will have their choice of ANY two TJ CDs. You can choose the Stampin' Companion, 3D and Fun Folds, Stampbooking, Emboss or Die, Fancy Folds and Motion, OR ANY of the 9 annual CDs. It is your choice! (NOTE: The Specialty CDs in any combination can be ordered from the TJ Home Page. Thanks for stopping by today -- hope you were inspired! Make sure to leave a comment here to enter the CD giveaway.